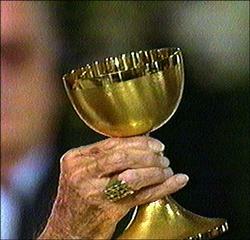 Re-live the momentous day, when the Knights of Columbus and the Diocese of Brooklyn had the special honor of co-hosting Pope John Paul II’s celebration of Mass at Aqueduct Race Track in New York. 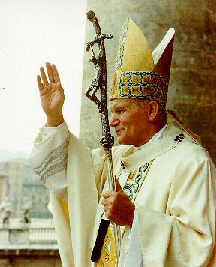 Pope John Paul II, the 263rd successor to the Apostle Peter. The Pontiff, Karol Wojtyla, a survivor of Nazi atrocities, communist persecutions, and an assassination attempt, has emerged to etch vividly his place in history. 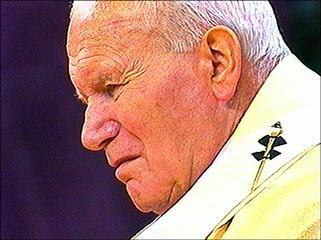 Wojtyla's rise from a modest chemical plant worker in Poland to the pinnacle of power in the Catholic Church is one of the greatest stories of faith in the 20th century. 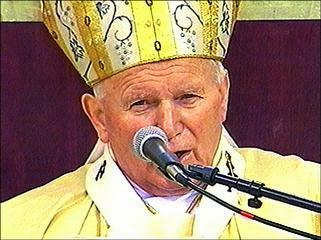 Led by Bishop Daily, more than 75,000 of the faithful greeted Pope John Paul II as he visited the Diocese of Brooklyn, for a Mass the pontiff celebrated at Aqueduct Race Track in Ozone Park. Reflecting on America and American life, he asked in words of pastoral concern: "Have the people living in this huge metropolis lost sight of the blessings which belong to the poor in spirit? In the midst of the magnificent scientific and technological civilization of which America is proud, and especially here in Queens, in Brooklyn, in New York, is there room for the mystery of God?